Welcome to the South Point High Class Of 1985 website! Welcome to our Class of 1985 website!!! Please take some time to look around and update your personal information and pictures. We had a wonderful 30 Year Reunion on Saturday, October 24th at the beautiful Wildlife Club in Belmont! Everyone had a wonderful time and the weather cooperated. We are still working to find all of our classmates. If you see a name on the Missing Classmates page, please forward our web address to them. We want to keep in touch with everyone. Saturday, October 17, 2015 - Service Project for South Point High School - Elizabeth Hardee-Johnson and Kent Hyde took four rose bushes to the school as a donation from our class. Saturday, October,24, 2015 - Main Event at the Gaston County Wildlife Club - Belmont. Since we did not get to physically go to Holy Angels due to the weather, we presented their staff with a check for $315.00. 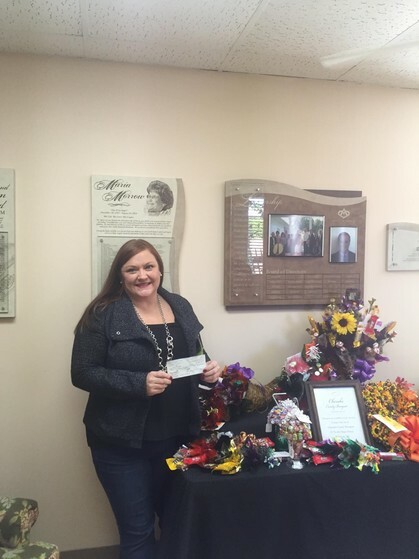 Thank you to Amanda Huffstetler-Teague for managing this event and delivering the check. We also have a page on .